Fig. 1: Checking the ammeter of an adjustable power supply. If the average or effective value has to be measured depends on the goal of the measurement. This will be explained in the article Theory & Definitions. The article Accuracy will explain more details about uncertainties of measured values. And the article Measurement Errors describes measurement faults caused by the measurement set-up itself. By definition could a current measurement be one of the most accurate measurements. The electrical current is namely defined as 6,2415077·1018 electrons per second. In principle could the number of electrons be counted who pass a point within a certain time. In this case the accuracy would then only be dependent on the accuracy of the used time standard. Unfortunately we have not yet succeeded to count electrons and therefore we one must rely on indirect phenomena caused by the electron flow. So is the force on a current carrying wire placed within a magnetic field proportional with the current. But the most common way is to measure the voltage across an impedance where the current is flowing through. Fig. 2: The current circuit must always be interrupted and an extra impedance is introduced. This voltage drop is called the burden voltage. Take into account that the impedance is more or less frequency dependent and could also cause a phase shift between the current and burden voltage. Thus a current measurement influences always the circuit to measure and the goals is to keep this influence as small as possible. When currents are measured, often instruments are used who aren't able to measure the current directly, such as an oscilloscope. And it can occur that the current is to high to measure this with a standard multimeter. Or it's necessarily to isolate the measurement instrument from the circuit. In these cases measuring accessoiries are used like an external shunt resistor or a current transformer in order to make the measurement possible. Fig. 3: Measuring set-up where the current indirectly is measured with the use of a shunt. A cheap and simple way to measure the current indirectly is by making use of a shunt resistor. The voltage across a shunt resistor is proportional with the current trough it. A shunt resistor is able to measure direct and alternating currents over a wide frequency range. To reduce the influence of the shunt resistor it must have an as small as possible resistance. Of cause the voltage across it has to be big enough to avoid interference and measurement errors. Detailed information about calculating and using shunt resistors is to find in the article Shunt resistors. Fig. 4: Measuring set-up where the current is measured with the use of a current transformer and shunt resistor. Another often used accessory for measuring currents is the current transformer. A great benefit of using current transformers is the galvanic isolation between the measurement instrument and the circuit whereof the current must be measured. A disadvantage of a current transformer is that only alternating currents can be measured, with the exception of special transformer types. Is the measured current includes also a direct current component, than the current transformer could be driven into saturation, that may result in measuring errors. Compared with a shunt resistor, a current transformer has a much smaller frequency range. The article Current transformers will discuss the current transformer in more detail. Fig. 5: Digital multimeter where the current range is selected. 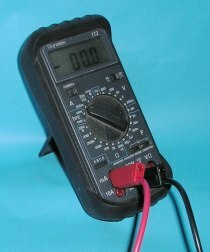 A commonly used instrument to measure current is the multimeter. The current measurement is based on the measurement of the voltage drop across an internal shunt resistor. The most multimeters use more than one shunt resistors for the different current ranges. Keep in mind that the resistance can be depend on the range that is selected. A multimeter user's manual will mention a maximum current than may not exceeded. Not every multimeter can handle this prescript maximum current continuously due to possible overheating. In these cases a maximum time that this current may flow is mentioned. The measuring of current in the DC-range will normally not cause any problems: This range will always measure the average current regardless the brand and type. The AC-range on the other hand can cause lot of confusions and errors. The reading is subject of the way the multimeter process the current and is therefore depended of brand and type. The article Multimeters: Measurement deviation will describe these measurement deviations in detail. Measured currents may always added together if these are average currents. After all, the average current represents the electron flow where the sign (= direction) is taken into account. Because electrons are physical particles, the adding of particles that flow by is always valid. 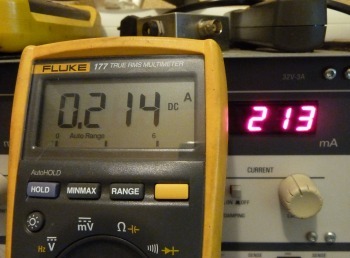 A multimeter in the DC-range measures always the average current. When alternating currents are being measured, rarely the average value is measured, but most of the time the (quasi) RMS-current is measured. The mean value of a pure alternating current is zero. Although the mean value is correct, it's impossible with this parameter to detect if there a current is flowing or not. The quasi or true RMS-current is mathematical operation of the real current. Therefore an adding of these measured values will not result in a valid outcome. Only under strict conditions it's possible to add these RMS-currents: The measured currents must have the exact same shape and phase shift. As long the measured currents are pure sine shaped it's allowed to add these vectorial. The phase must thus take into account. The practical applications are only basic loads such as ohmic, inductive and capacitive loads. Fig. 7: Vectorial adding of currents. Fig. 6: Circuit with simple loads where the currents are vectorial added. Figure 6 shows a load example whereof the currents, the phase taken into account, may add together. A sine shaped alternating voltage V is connected to the following loads: A series circuit of a capacitor and resistor Ra, C, a resistor Rb and an inductor L.
The corresponding vectors of this circuit are shown in figure 7. The colors of the components and vectors match with each other. The vector of the total current Itot is drawn indirectly. First the vector IRL is drawn from IR and IL. This intermediate result is used together with the vector IRC to draw the total current. Fig. 8: The calculations for vectorial adding of currents. The total current can also be calculated by adding the sine and cosine parts of the three currents. And calculate the total current from these results. The phase is given in degrees, and the light gray calculations are the associated cos-φ. Fig. 9: Circuits with non-linear components who draw irregular currents that can't be easily added. A rectifier circuit of an electronic device (Ie). Fig. 10: The current shapes in the circuit above. Fig. 11: Adding the currents with irregular shapes. Each of the loads connected to the alternating current source VAC draw different shaped currents. The total current Itot(t) of the three loads is also shown. The RMS-current of the three loads is calculated: dimmer Idrms, motor Imrms and the rectifier circuit Ierms. If the three RMS-currents are added together Iadd than this appears not to agree with the real total RMS-current that flows to the common wire Itrms. The conclucion from this is that it's inpossible to calculate the total current if individual currents are measured. The total current must always be measured.